As the city that never sleeps, New York’s oft-revered insomnia has crafted an incredible list of things to do in its wake. You’d have to work hard to be bored in the Big Apple, and with attractions ranging from markets to museums to plain old people watching in the park, you’ll never run out of experiences to gather. Located in Battery Park, The American Merchant Mariner’s Memorial is dedicated to all American merchant marines—past, present, and future. If you’re searching for a unique tribute, this memorial is intriguing: half of the memorial is underwater, a sinking shipmate reaching his hand out to a fellow marine. Initially inspired by a photograph, the sculpture is thought provoking and a fitting tribute to those who were lost at sea. An urban neighborhood staple, Chelsea Market is entrenched in history. The space has been many things: at first a trading spot for the Algonquin Indians and later the site of the National Biscuit Company. Chelsea Market made staked its claim 15 years ago, and has remained an NYC destination ever since. Don’t wander through this 35-vendor market hungry: you’ll surely wander out with ten bags of groceries that won’t fit in your cab back home. Instead take in the market’s colors and eccentricities, and savor the taste of New York. 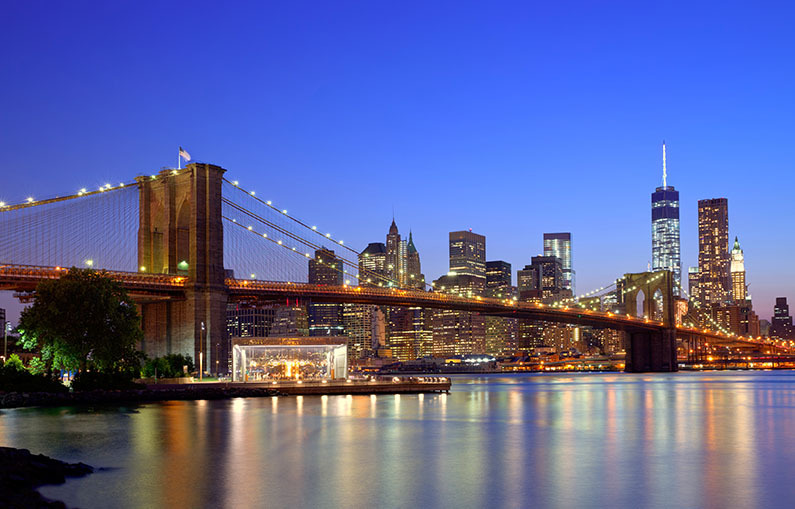 Besides the Golden Gate, the Brooklyn Bridge is one of the most recognizable bridges in our nation. Take a trip to the movies and see this bridge in the background of millions of iconic shots; take a walk along the real thing and realize the sheer impact it has made upon the world of architecture. It’s easy to get lost at the Metropolitan Museum of Art, though it’s a spot worth getting lost in. Home to a drool-worthy collection, the Met boasts a Medieval Sculpture Hall, dozens of Egyptian artifacts, and an iconic piece by van Gogh. Go in with a list of “must-sees” but keep an open mind: you never know which hall might fascinate you the most. To plan your trip to New York or for an extended guide of things to do, visit the official NYC city guide at www.nycgo.com.